For many, the realm of emotions is weary and difficult to manage. Over the years, I myself had many emotional challenges and tough situations with strong emotional charge. Before becoming a therapist, I had worked as a manager in the evens industry, and that required a lot of attention, determination and hard work, but also the ability to master my emotions when things went weird… The hard work and strong emotional charge made, at some point, my health and balance decrease, so I had to find ways of getting back on track. After some years of meditation and various healing techniques that I’ve learned and practiced, I found this simple Taoist technique that helps regaining calm and peace but also resolves serious health issues. “In the Taoist tradition, positive and negative emotions are associated with the internal organs. 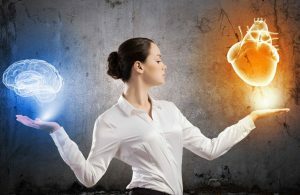 One of the keys to good health is to become aware of the emotional energies that reside in the organs, and to transform the negative emotional energies into positive virtues. Taoists believe that we are all born with the virtues of love, gentleness, kindness, respect, honesty, fairness, justice, and righteousness. Figure 1. The positive virtues. Unfortunately, as we mature and encounter more stress in our daily lives, negative emotions such as fear, anger, cruelty, impatience, worry, sadness, and grief often predominate. The negative emotions have deleterious effects on the internal organs and glands, draining our life-force and undermining our health. Figure 2. The negative emotions are the body’s garbage. In the Tao “emotional intelligence” is a process of recognizing emotions by their effects on the body, and employing exercises that transform the negative emotions into positive life force, or Chi. Two important exercises are the “Inner Smile” and the “Six Healing Sounds” techniques, as taught by Master Mantak Chia. Figure 3. The negative emotions affect the body’s organ systems. Taoists learned the relationships between emotional energies and organ systems over many centuries of study and meditation. They developed methods to transform negative to positive emotions from their practical and intuitive understanding of the human body. Many of the Taoist insights are supported by observations and evidence from modern psychology and medicine. The “Inner Smile” and “Six Healing Sounds” exercises focus on five organs or organ systems: the heart, the lungs, the kidneys, the liver/gall bladder, and the stomach/spleen. Table 1. 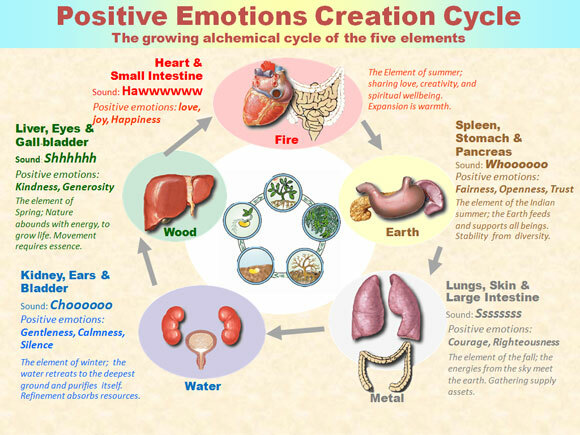 The five major organ systems and their associated emotions and properties. · The heart is associated with the negative emotions of arrogance and hate and the positive virtues of kindness and love. Recent scientific research shows that feelings of love and appreciation strongly influence the heart’s rhythm and its relationship to the body’s physiological systems (see www.heartmath.org). · The lungs are associated with the negative emotions of sadness and depression, and the positive virtues of courage and righteousness. Emotional depression is often recognized by a physical depression and collapse of the chest and lungs. · The kidneys are associated with the negative emotion of fear and the positive emotions of gentleness and kindness. Fear is closely related to the activity of the adrenal glands that lie on top of the kidneys. The adrenal glands secret adrenalin and noradrenalin when stimulated by the body’s fight-or-flight response. 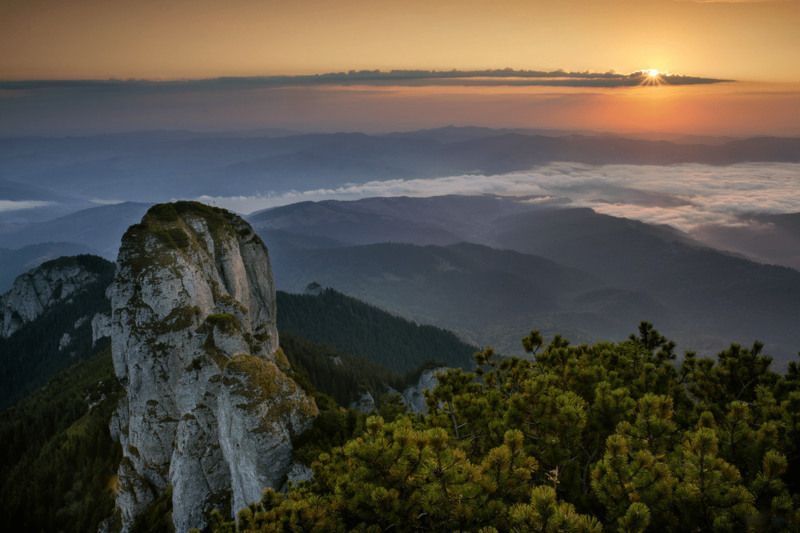 · The liver is associated with the negative emotion of anger and the positive emotions of generosity and forgiveness. Physiologically, the liver is important for storing and rapidly releasing glucose into the blood. The energy of anger requires the rapid availability of metabolic energy stores in the body. · The stomach/spleen are associated with the negative emotions of worry and anxiety and the positive emotions of fairness and openness. Most people will be familiar with the “butterflies” and “knots” in the stomach related to worry, apparently related to a network of network of neurons and neurotransmitters in the sheaths of tissue lining the digestive system, known as the enteric nervous system (Gershon, 1998). The Inner Smile and Six Healing Sound exercises direct our attentions to the body’s organs and associated qualities. We successively visualize each organ, cleansing the organ and transforming negative emotional energies into positive virtues. In the Taoist tradition, each person assumes responsibility for the emotions that arise within, regardless of the external events that trigger the emotions. Taoist exercises take us into our bodies and transform emotions by transforming the associated physiological systems. The Inner Smile and Six Healing Sounds exercises help balance and integrate our sympathetic and parasympathetic nervous systems, promoting health, resilience, and vitality. Figure 5. The Proper sitting posture. 1. Become aware of your lungs. Take a deep breath and, letting your eyes follow, raise the arms up in front of you. When the hands are at eye level, begin to rotate the palms and bring them up above the head. Keep the elbows rounded. You should feel a stretch that extends from the heels of the palms, along the forearms, over the elbows, along the upper arms and into the shoulders. The lungs and chest will feel open and breathing will be easier. Draw the corners of the mouth back, exhale, making the sound “Ssssssss”, sub-vocally, slowly and evenly in one breath. Figure 11. The Lung Sound Position. 2. As you exhale, empty all feelings of sadness, sorrow and grief from your lungs. 3. When you have exhaled completely (without straining), rotate the palms down, close the eyes, and breathe in to the lungs to strengthen them. If you are color oriented, imagine a pure white light and quality of righteousness entering into your lungs. Float the arms down by gently lowering the shoulders. Slowly lower them to your lap so that they rest there, palms up. 4. Close the eyes, breathe normally, smile down to the lungs, be aware of the lungs, and imagine that you are still making the sound. Pay attention to any sensations you may feel. Try to feel the exchange of cool, fresh energy replacing hot, dark waste energy. 5. Repeat the sequence 3 to 6 times. For colds, flu, mucous, toothaches, smoking, asthma, emphysema, or depression, or for detoxifying the lungs, you can repeat the sound 9, 12, 18, 24, or 36 times. 6. The Lung Sound can help eliminate nervousness when in front of a crowd. The Lung Sound sub-vocally without the hand movements several times when you feel nervous. This will help you to calm down. The Heart Sound and the Inner Smile will help also if the Lung Sound is not enough to calm you down. 1. Become aware of the kidneys. Place the legs together, ankles and knees touching. Take a deep breath as you bend forward, and clasp one hand in the other; hook the hands around the knees and pull back on the arms. With the arms straight, feel the pull at the back where the kidneys are; look up, and tilt the head back without straining. 2. Round the lips and silently make the sound one makes in blowing out a candle. At the same time, press the middle abdomen, between the sternum and navel, toward the spine. Imagine any feelings of fear being squeezed out from the membrane around the kidneys. 3. When you have exhaled completely, sit up and slowly breathe in to the kidneys, imagining a bright blue energy as the quality of gentleness enters the kidneys. Separate the legs to a hip’s width and rest the hands, palms up, on the thighs. 4. Close the eyes and breathe normally. Smile to the kidneys, as you imagine that you are still making the sound. Pay attention to sensations. Be aware of the exchange of energy around the kidneys, and hands, head and legs. 5. Repeat 3 to 6 times. For back pain, fatigue, dizziness, ringing in the ears, or detoxifying the kidneys, repeat 9 to 36 times. 1. Become aware of the liver, and feel the connection between the eyes and the liver. Place your arms at your sides, palms out. Take a deep breath as you slowly swing the arms up and over the head. Follow with the eyes. Figure 13. The Liver Sound position. 2. Exhale with the sound, “Shhhhhhh”, sub-vocally. Envision and feel that a sac encloses the liver and is compressing and expelling the excess heat and feelings of anger. 3. When you have exhaled completely, unlock the fingers, and pressing out with the heels of the palms, breathe into the liver slowly; imagine a bright green color quality of kindness entering the liver. Gently bring the arms back to the side by lowering the shoulders. Place your hands on your lap, palms up, and rest. 4. Close the eyes, breathe normally, smile down to the liver and imagine you’re still making the sound. Be aware of sensations. Sense the energy exchange. 5. Do this 3 to 6 times. For anger, red and watery eyes, or a sour or bitter taste, and for detoxifying the liver, repeat 9 to 36 times. A Taoist axiom about controlling anger says: If you’ve done the Liver Sound 30 times and you are still angry at someone, you have the right to slap that person. 1. Become aware of the heart and feel the tongue connected with the heart. Take a deep breath and assume the same position as for the Liver Sound, but lean slightly to the right. Figure 14. The Heart Sound position. 2. Open the mouth somewhat, round the lips and exhale on the sound “Hawwwwwww”, sub-vocally, as you picture the pericardium releasing heat, and the feelings of impatience, arrogance and hastiness. 3. For the rest cycle, repeat the procedure for the Liver Sound, but focus attention on your heart and imagine a bright red color and the qualities of joy, honor, sincerity and creativity entering the heart. 4. Repeat 3 to 6 times. For a sore throat, cold sores, swollen gums or tongue, heart disease, heart pains, jumpiness, moodiness, and for detoxifying the heart, repeat 9 to 36 times. 1. Become aware of the spleen; feel the mouth and the spleen connect. Take a deep breath as you place your hands with the index fingers resting at the bottom and slightly to the left of the sternum. Press in with the fingers as you push out with the middle back..
2. Exhale with the sound “Whoooooo”, made sub-vocally and felt in the vocal chords. Expel the excess heat, wetness and dampness, and the emotions of worry, sympathy and pity. 3. Breathe into the spleen, pancreas, and stomach, or imagine a bright yellow light, and the qualities of fairness, compassion, centering, and music making entering them. 4. Lower the hands slowly to your lap, palms up. Close the eyes, breathe normally and imagine you are still making the sound. Be aware of sensations and the exchange of energy. 5. Repeat 3 to 6 times. Repeat 9 to 36 times for indigestion, nausea and diarrhea, and for detoxifying the spleen. This sound, done in conjunction with the others, is more effective and healthier than using antacids. It is the only sound that can be done immediately after eating. The Triple Warmer refers to the three energy centers of the body. The upper level, which consists of the brain, heart, and lungs, is hot. The middle section consisting of the liver, kidneys, stomach, pancreas, and spleen, is warm. The lower level containing the large and small intestines, the bladder, and the sexual organs, is cool. The Triple Warmer Sound balances the temperature of the three levels by bringing hot energy down to the lower center and cold energy up to the upper center, through the digestive tract. This induces a deep, relaxing sleep. A number of students have been able to break a long-standing dependence on sleeping pills by practicing this sound. It’s also very effective for relieving stress. Figure 16. The Triple Warmer Sound position. 1. Lie down on your back. Elevate the knees with a pillow if you feel any pain in the small of the back or lumbar area. 2. Close the eyes and take a deep breath, expanding the stomach and chest without strain. 3. Exhale with the sound “Heeeeeee”, made sub-vocally, as you picture and feel a large roller pressing out your breath, beginning at the top of the chest and ending at the lower abdomen. Imagine the chest and abdomen are as flat as a sheet of paper, and feel light, bright, and empty. Rest by breathing normally. I have been practicing this regularly for more than 5 years, and am also teaching it in the TRANSFORMING THE EMOTIONS class and the HEALING EXERCISE FOR RELATIONSHIPS, COMMUNICATION&SEXUALITY. To watch out interview with Mantak Chia, the author of this technique, join the Pranic Consciousness Summit. Want to be a master of self confidence? Chia, Mantak, 1986. Taoist Ways to Transform Stress into Vitality: The Inner Smile, Six Healing Sounds, Huntington, NY: Healing Tao Books. Chia, Mantak, and Maneewan Chia, 1993, Awaken Healing Light of the Tao, Huntington, NY: Healing Tao Books. Gershon, Michael D. 1998. The Second Brain: The Scientific Basis of Gut Instinct and a Groundbreaking New Understanding: of Nervous Disorders of the Stomach and Intestine. HarperCollins.